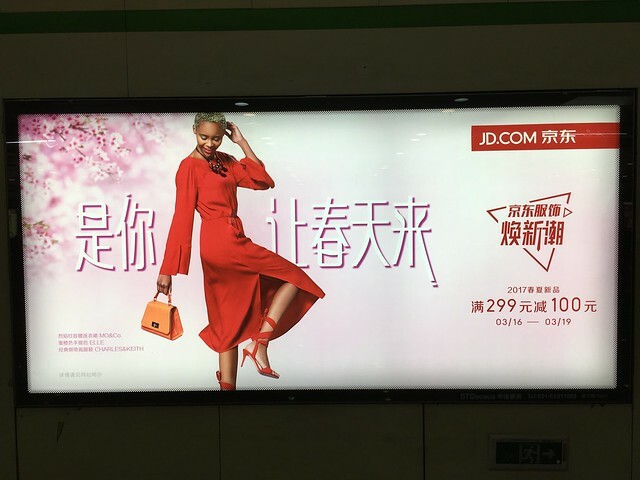 When I first saw these ads, I felt that this woman looked familiar, but I couldn’t place her, and the Chinese name 汪可盈 didn’t mean anything to me. 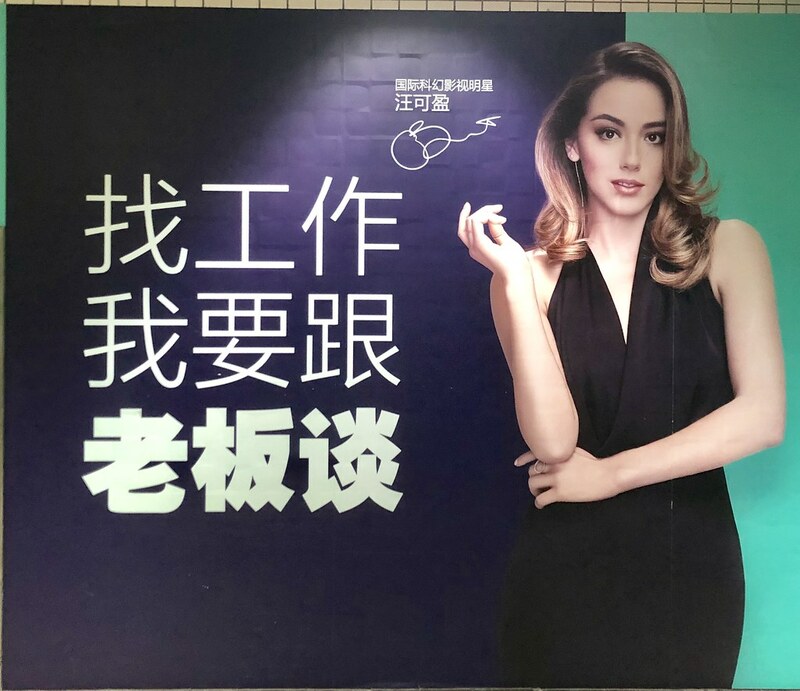 I also felt like she didn’t look 100% ethnically Chinese, despite the Chinese name (and lack of English name). Turns out this is Chloe Bennett, the star of Agents of S.H.I.E.L.D. 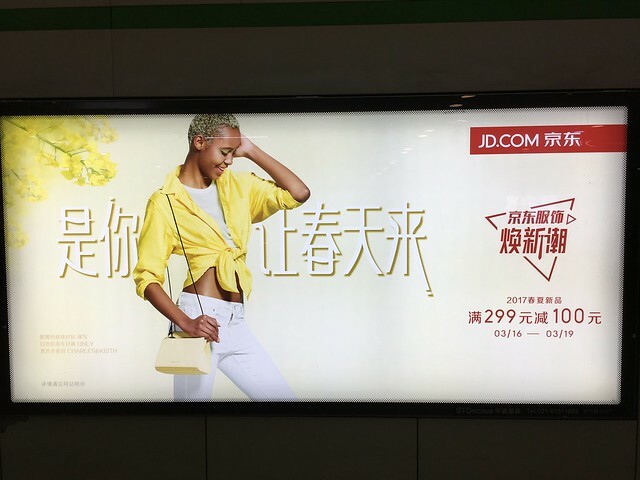 It’s kind of interesting how her English name in the U.S. shows no trace of Chinese heritage, but when she appears on ads in China, her English name is not used at all. 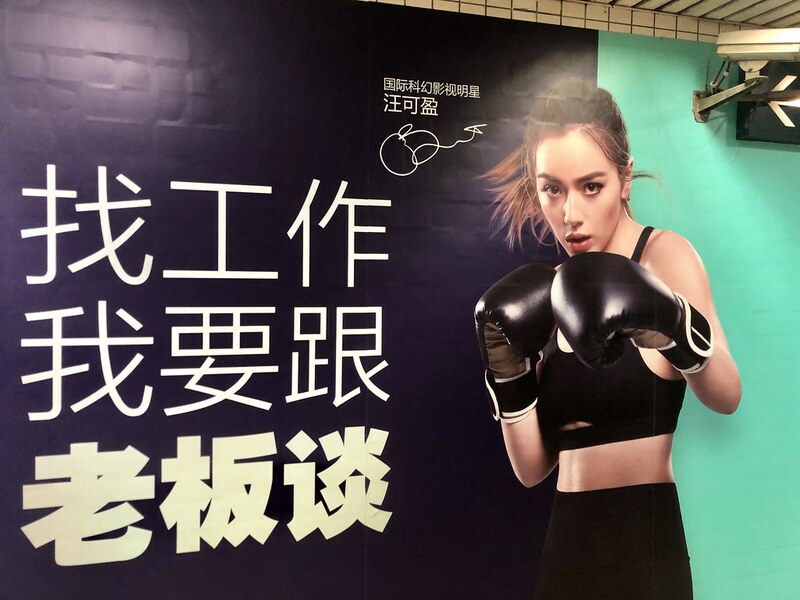 Turns out that “Wang” is her surname by birth (her father is Chinese), and she actually pursued a singing career in mainland China as a teenager, using the name 汪可盈. 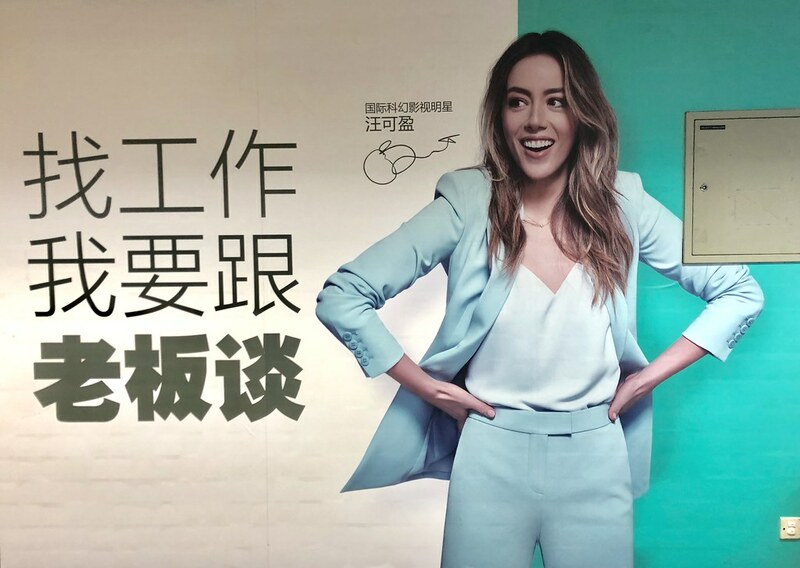 While pursuing an acting career in Hollywood, she changed her name to “Chloe Bennet,” after having trouble booking gigs with her last name. According to Bennet, using her father’s first name, rather than his last name avoids difficulties being cast as an ethnic Asian American while respecting her father. First of all the repeating character is 鹅, which means “goose.” In the circular logo, you can see a little characterplay going on with the goose head. Above that, you have “鹅，鹅，鹅” which, of course, reads “goose, goose, goose.” This is a famous first line of a classical Chinese poem. It’s famous because it’s so simple, so a lot of kids memorize it as one of their first (if not the first) classical poems committed to memory. You bend your neck towards the sky and sing. Your red feet push the clear waves. 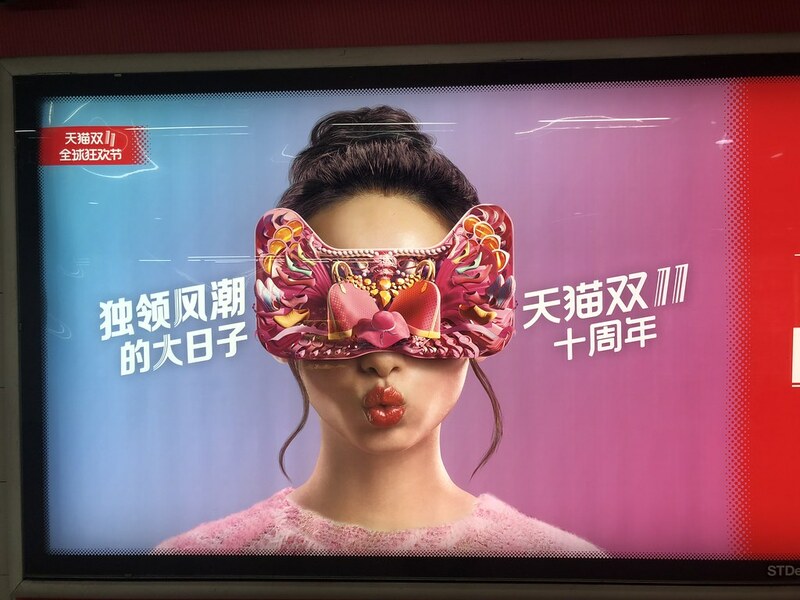 The mask is in the shape of Tmall‘s logo, a cat. 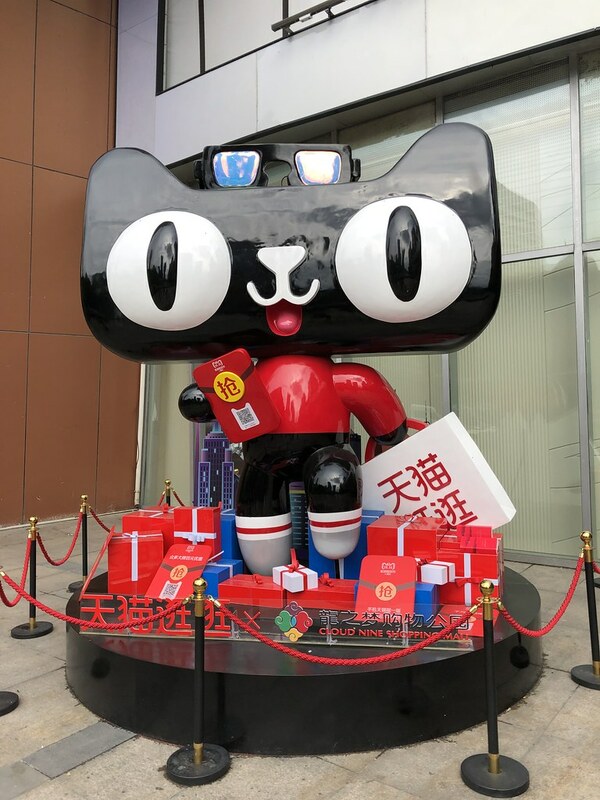 Tmall’s Chinese name is 天猫, which literally means “Sky Cat,” but it seems like it was chosen based on the English name (“T” for Taobao, which owns Tmall, and “mao” sounds like “mall” to Chinese ears). 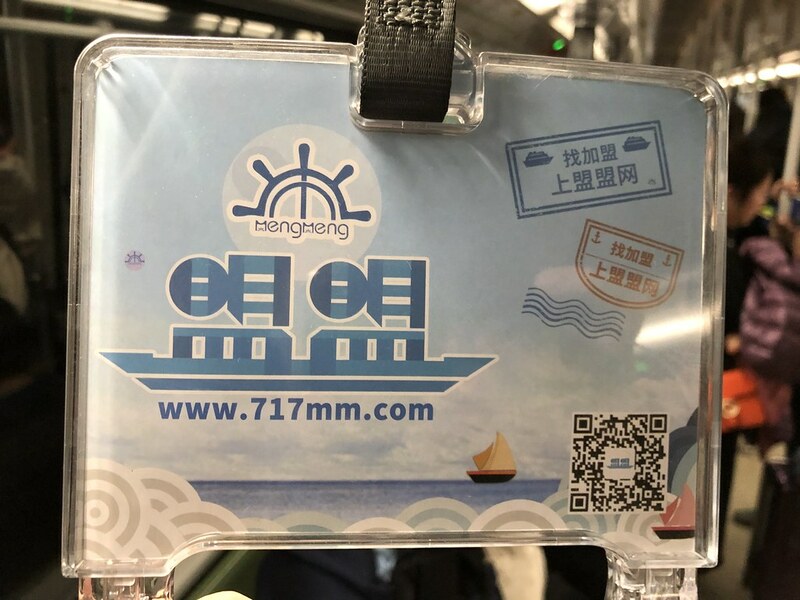 It’s funny that you sometimes see the 双11 (literally, “Double 11”) manufactured holiday translated in English as “Singles Day” (formerly “Bachelor’s Day”). This day was once celebrated as such, but in a few short years, the shopping aspect has completely taken over the “holiday.” Single people feel entirely irrelevant now. But hey… who cares about human connections when you can spend money on all these great deals?? 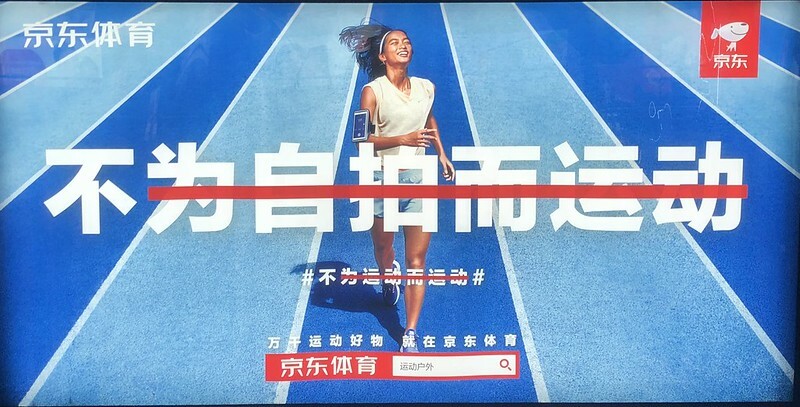 They are: 生活现场. 生活现场 is a phrase that’s not easy to translate… if you ask a native speaker what it means, they’ll have trouble answering you without a context. 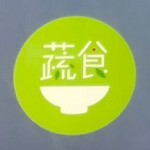 It’s something like “scenes of daily life.” The characterplay kind of works, I guess… I like the 场 the best. The 生 is not impressive. 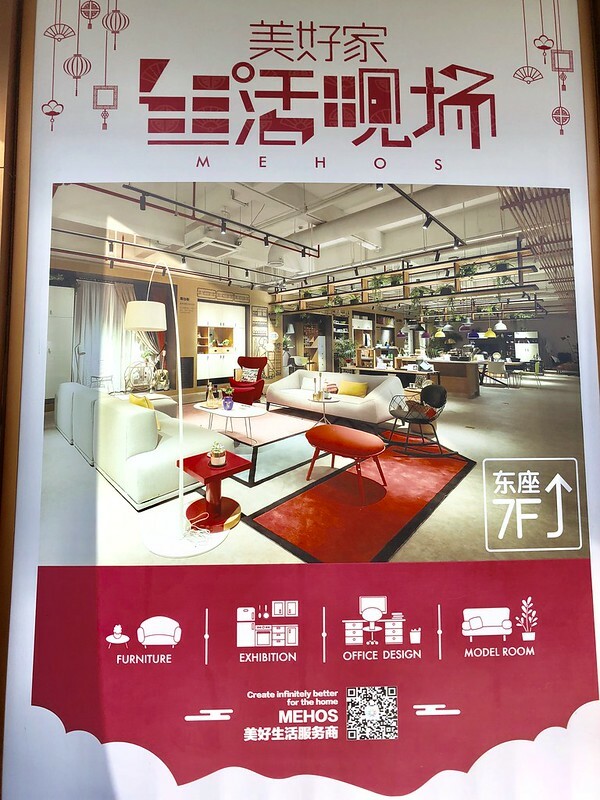 Anyway, the ad is for 美好家 (MEHOS), a furniture store in Shanghai. As a parent, I am keenly aware of all the work that goes into educating a child on what is “dirty” and how to avoid getting dirty, as well as why getting dirty is (normally) bad. The concept of “dirty” is surprisingly complex when you think about it, since some of it is visible and some not, and the “clean” and “dirty” objects can have all kinds of interactions. You really just have to be taught. Just like children, as a China newbie, I, too, had to be educated on what was “dirty” in my new environment. 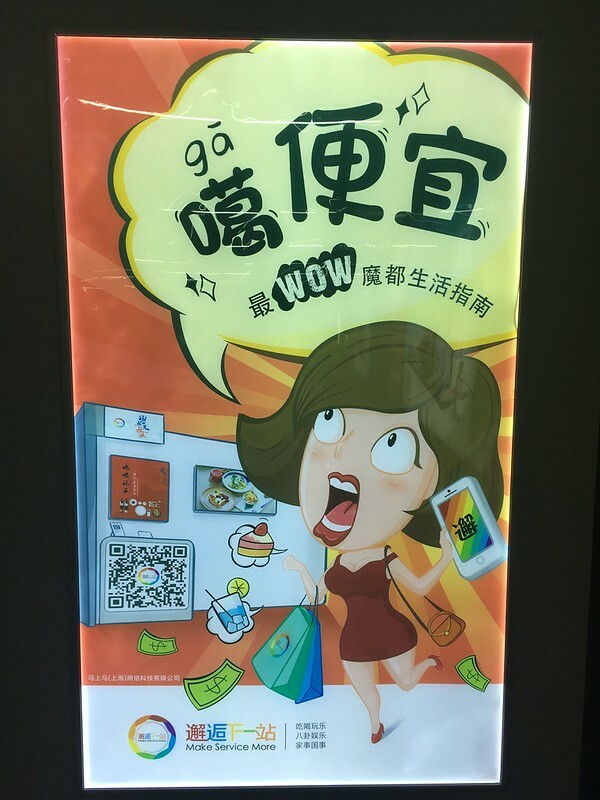 A similar example comes to mind: foreigners often think nothing of storing their bag on the ground next to their desks or chairs, but this frequently causes Chinese acquaintances to recoil in disgust. 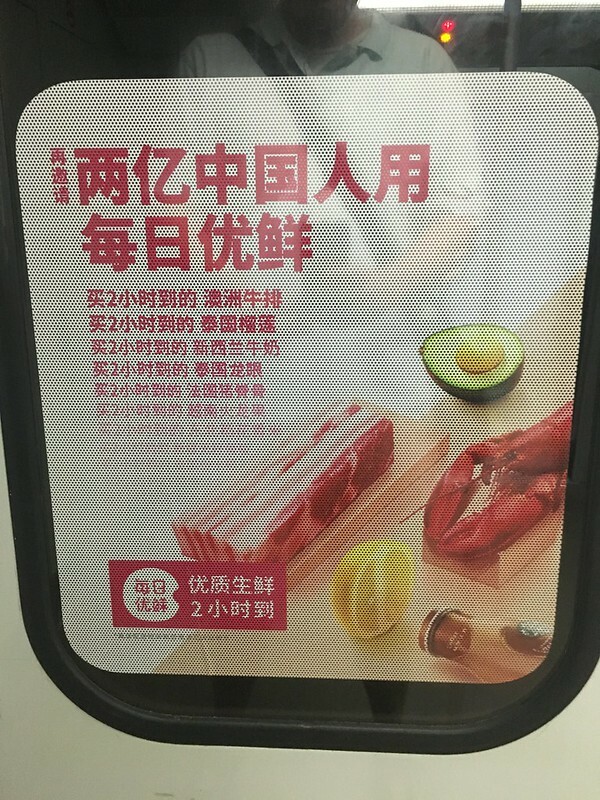 In China, you don’t put things you want to keep clean (like your bag) on the ground, even indoors. You also don’t put your bag on your bed at home. There are lots of “rules” to learn. What caught my attention was the font. “Blocky” (sometimes pixely) fonts are quite common, but I’ve never seen one so “spaced out” like this before. 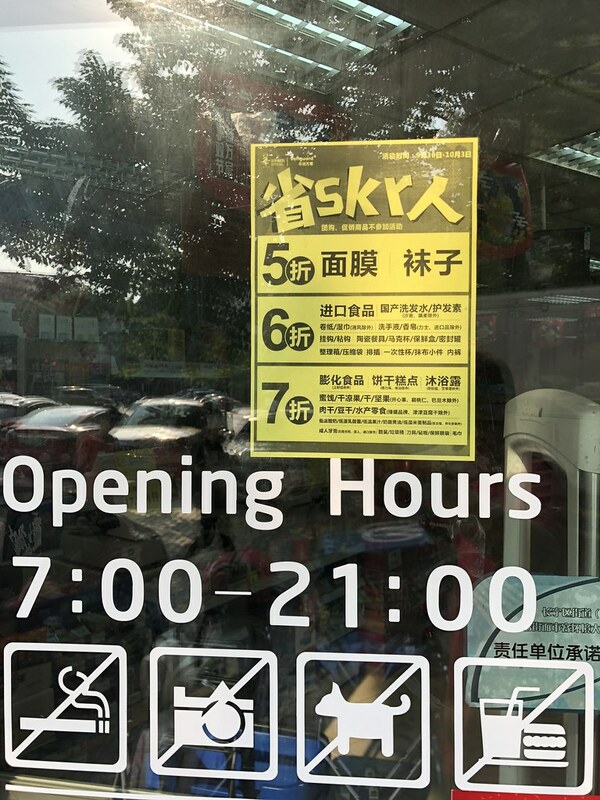 Yet the word 流行 (“popular”) is clearly visible. 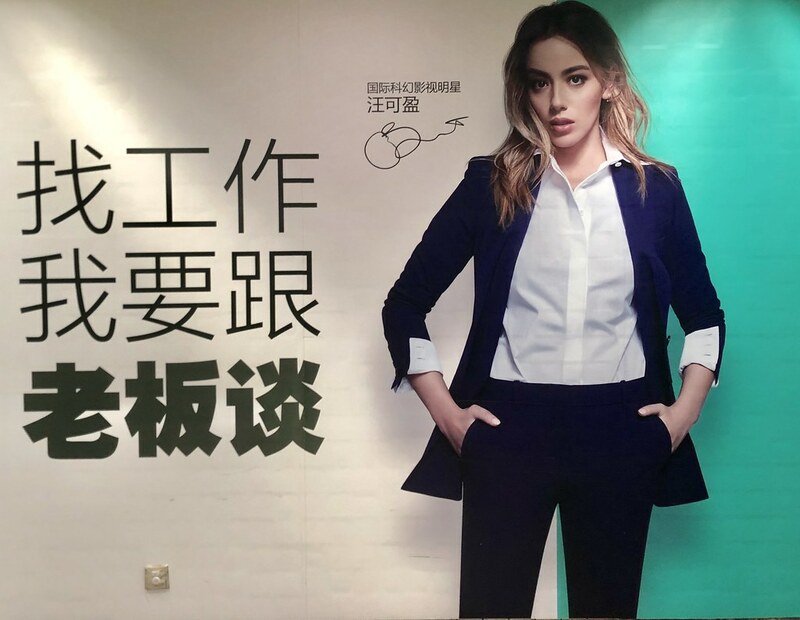 Nice of the poster to include the pinyin for 流行 (liúxíng), though! Chris Lee is the English name for Li Yuchun (李宇春), which some of the older “China watcher” crowd might remember for her rise to prominence on the popular “Super Girl” singing competition in 2005. 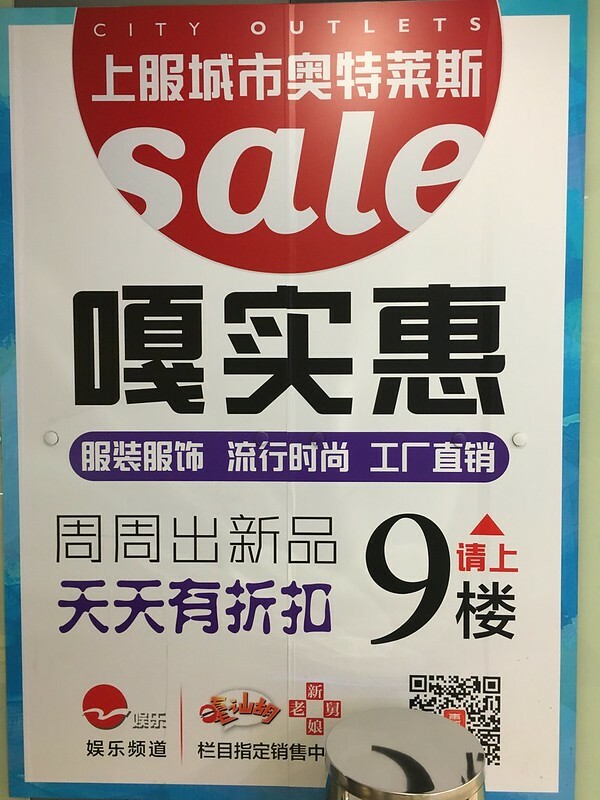 Note: The way that “Cloud Nine Mall” (龍之梦) is written breaks the “golden rule” that I learned in Chinese 101: Either write entirely in simplified characters or write entirely in traditional characters. Never mix the two. The simplified dragon character 龙 is written using the traditional 龍. 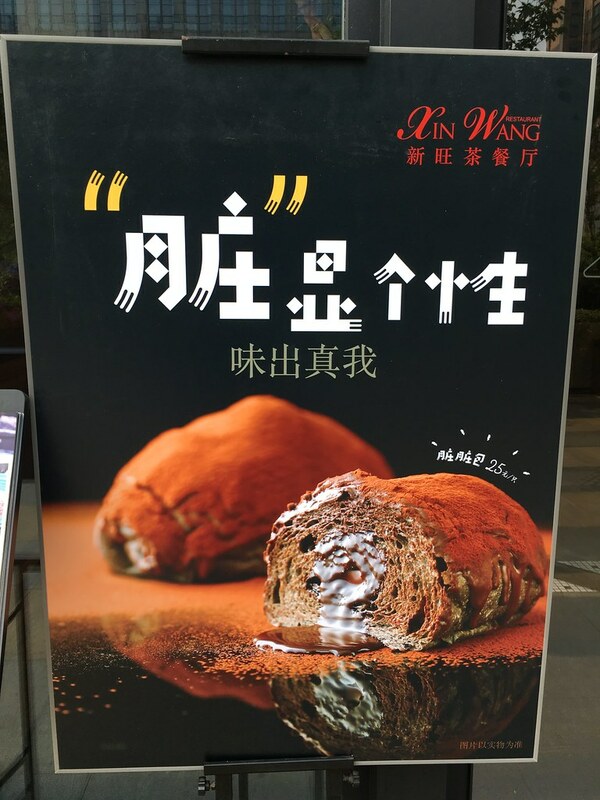 “食代” is a pun on 时代. 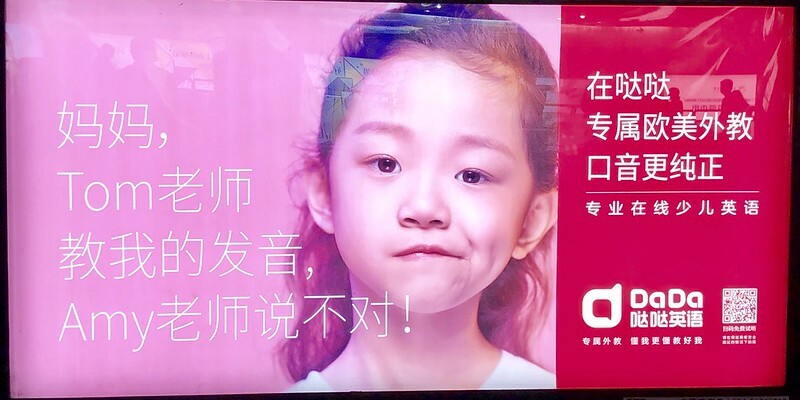 This ad made me wonder: cultural differences aside, is the bandwagon effect stronger in China because there’s a larger population? 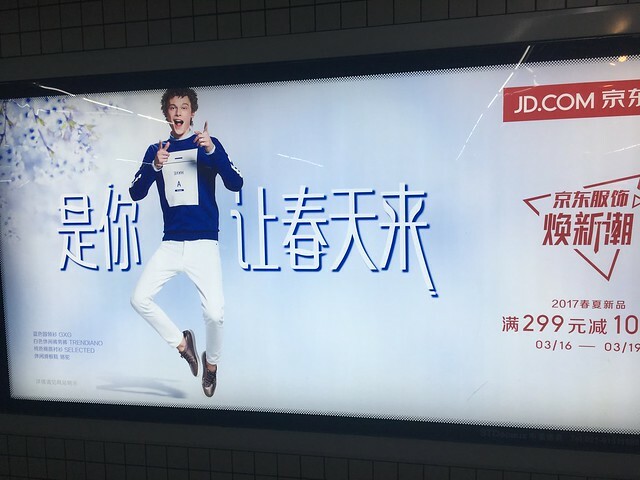 Similarly, is the bandwagon effect more powerful when used in advertising in China? 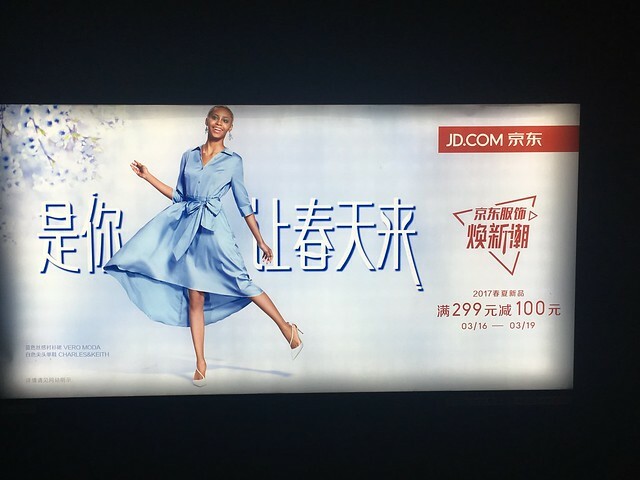 The brand name is 每日优鲜, which could be translated to something like “Daily Excellent Fresh.” But then they called themselves “Miss Fresh” in English, so that’s the name I used. 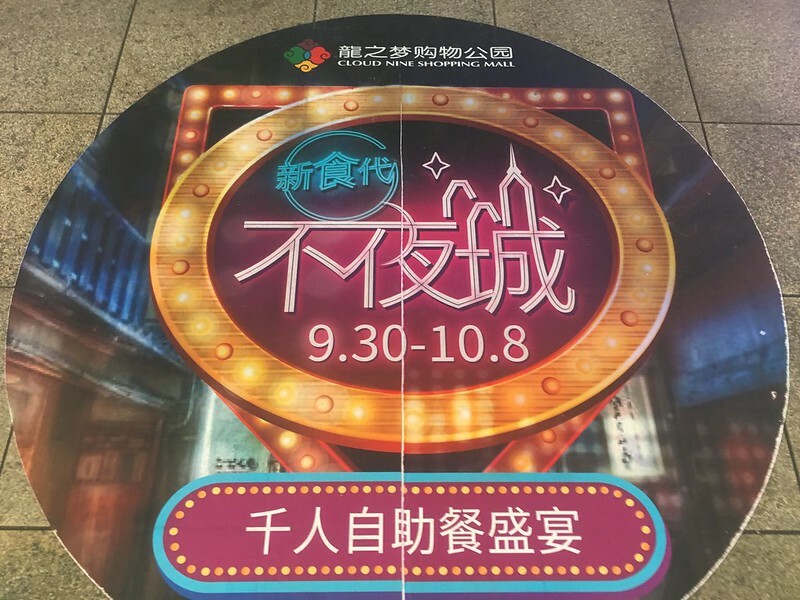 Spotted this sign on 老外街 (“Laowai Street”) on Hongmei Road (虹梅路). 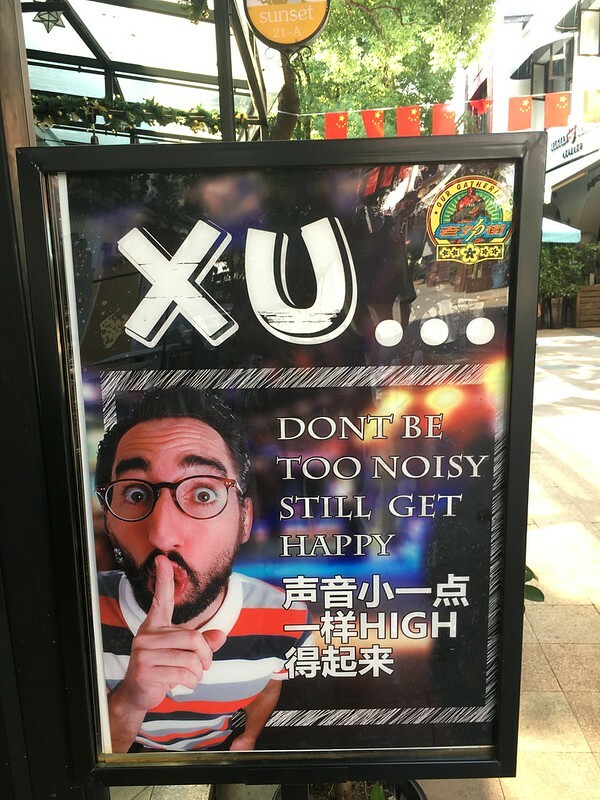 First of all, “xu” in pinyin is how you spell the word for “SHHH” (the “shushing” sound) in Chinese. 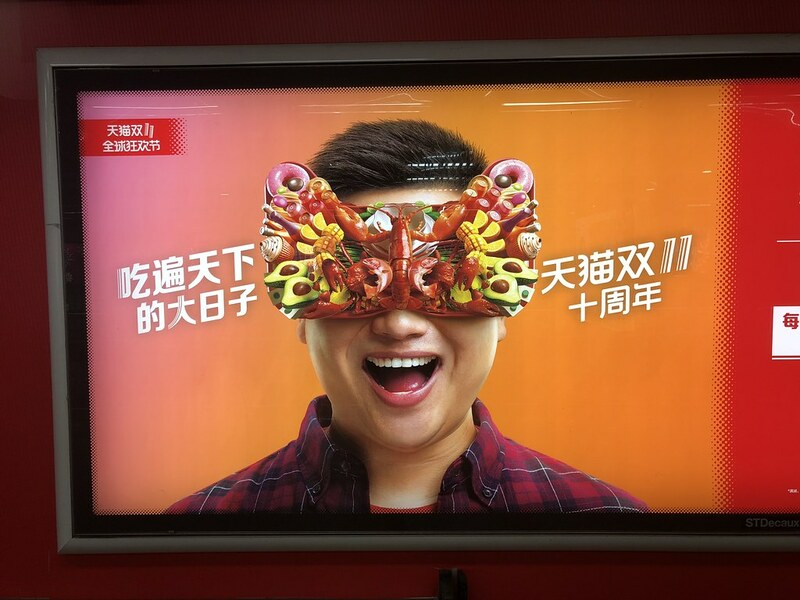 It even has a character: 嘘. So 声音小一点 refers to one’s voice being a little quieter. The “if” part and the “you” subject are implied. 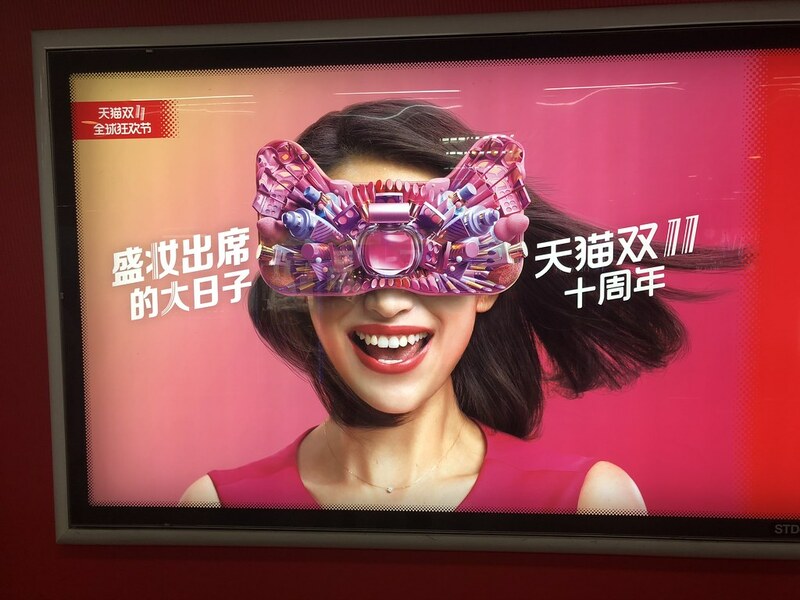 The “HIGH” in Chinese is not (usually) some kind of drug-induced state, but rather the “natural high” of just getting all excited and having a blast. There could be some drinking involved (think karaoke), but the emphasis is on the fun had. Answer: In that example, 起 is a verb, and 来 is the direction complement. You insert 得 between the two to make it into a potential complement, adding the meaning of “can.” 起得来 = can get up. 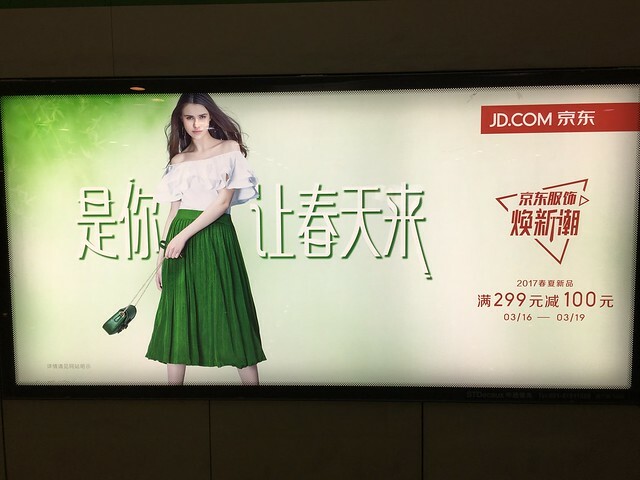 In the blog entry, I linked to one grammar point on uses of 起来, and another on potential complements. It’s the combination of the two that you need to understand to fully get this. It’s a little tricky! “茶π“?! Why in the world…? 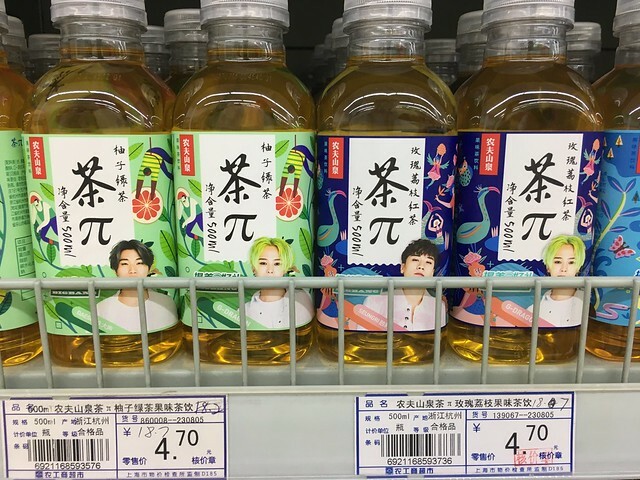 I showed this to some Chinese friends, asking them why anyone would put π in the name of a bottled tea drink. No one had an answer. I speculated that maybe the “π” was being used as a pun on 派, meaning “faction” or “clique”? They didn’t really like that theory, but they had nothing better to offer. What is “Tea Pi,” you ask? 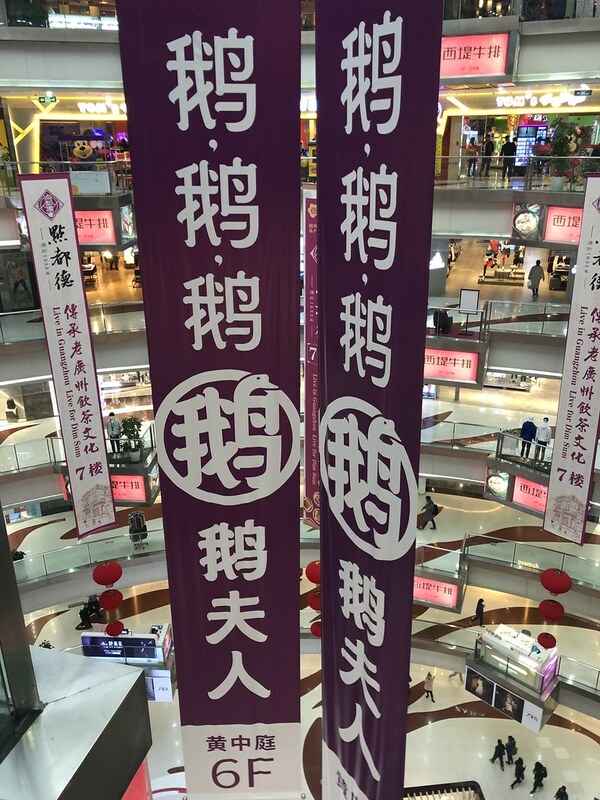 Nongfu Spring‘s official answer: a combination of tea and fruit flavors, infinitely unrepeating π, which is also our infinitely unrepeating youth! Uhhh… there’s nothing I can say to that! Translation: kids these days like random stuff. The top reads 江南 (Jiangnan), which is the Chinese equivalent of “Gangnam” (yes, as in “Style”). 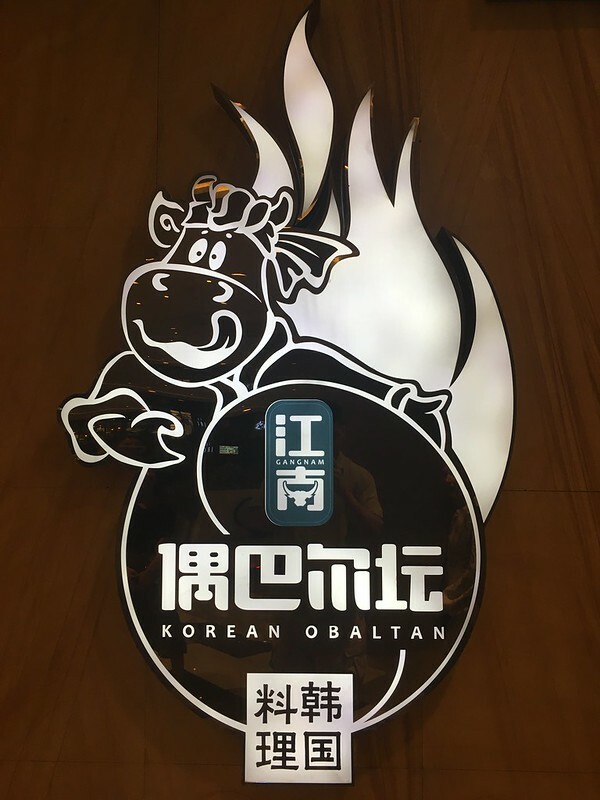 The bottom hard-to-read part says 偶巴尔坛, a transliteration of the Korean word “Obaltan” (오발탄), which apparently is the best Korean movie ever made? (I’m a bit out of my depth on this one.) 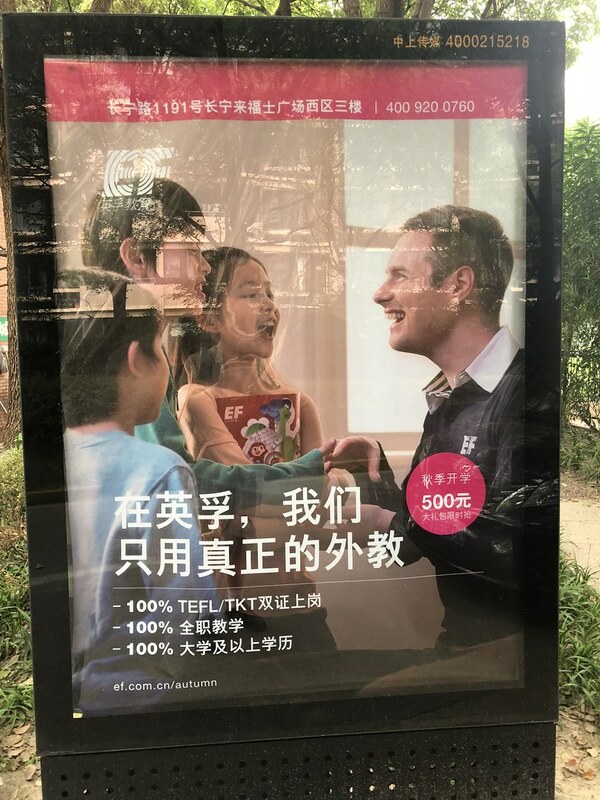 Anyway, don’t feel bad for not knowing what 偶巴尔坛 is as a Chinese learner! 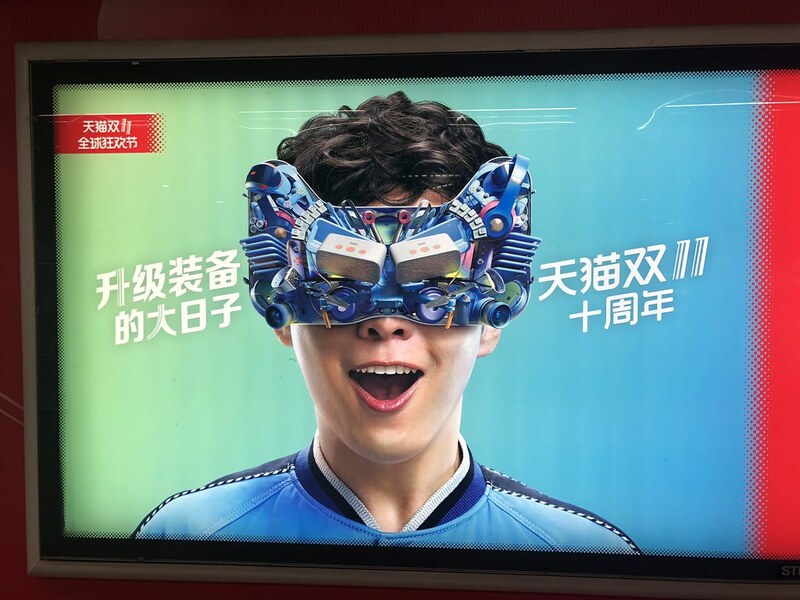 UPDATE: Commenter Lin and reader Danny point out something I glossed over in the original post: the first ad uses the character 噶, and the second ad uses 嘎. Both are “gā” in this context. So what’s the difference? Well, the short answer is that since this is not a standard word (both characters can be found in the authoritative 现代汉语词典 dictionary, but neither list this meaning), there is no “officially correct” character for it. 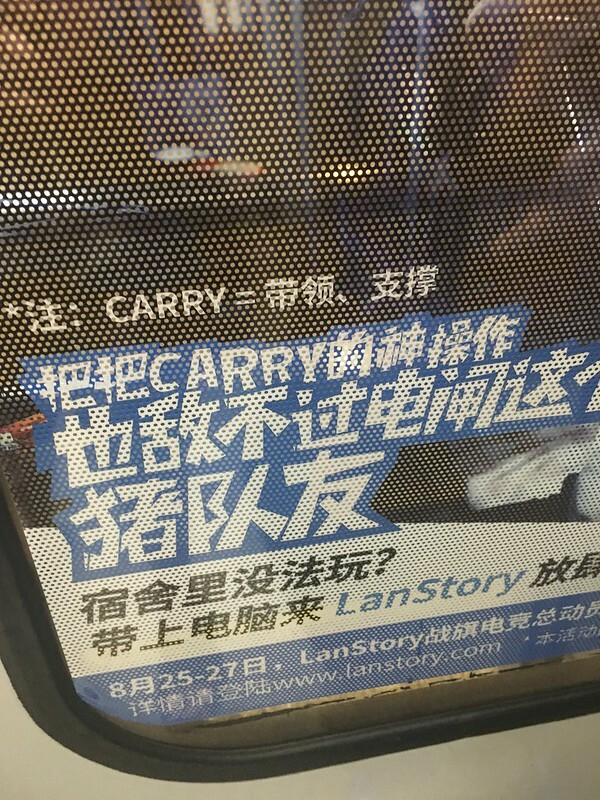 In my experience, however, 嘎 is more widely used, and it’s also the one my computer’s pinyin input prompts first.